NOTE: The 'running of the bulls' is only a small part of the torment these animals endure for this public abuse. 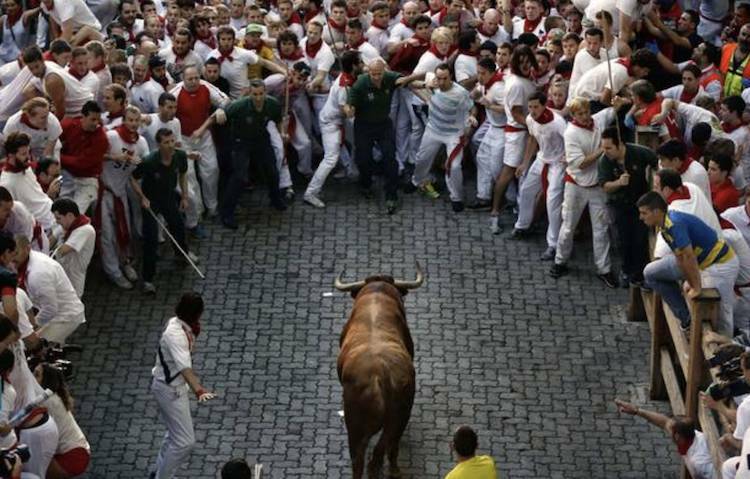 The organisers recruit tourists from Australia, USA, Britain and other “civilised” countries to participate in Number 8 above, by encouraging them to get drunk and ‘take part’ in the “running” of the bulls. If you like running, don’t do it in Pamplona. Well, you can, but don’t do it in July. Why? Because if you do, you will not be running on cobbles or tarmac, but on the blood of fallen animals. Every year in July, a festival is celebrated in Pamplona, Spain. Every year in June, a festival is celebrated in Yulin, China. What do these two festivals have in common? They are both based on the ritualised abuse and killing animals in front of crowds of people. In Yulin the victims are dogs, which will end up skinned alive and eaten by tourists. In Pamplona the victims are bulls, which will suffer a similar fate. Would you be uncomfortable traveling to Yulin knowing that what takes place is a massacre of dogs? Is it therefore reasonable to assume that you would be similarly uncomfortable if you knew what happened in Pamplona was not a harmless spectacle dressed up in tradition, but the public slaughtering of bulls? If you didn’t know that this is what really takes place, I wouldn’t be surprised. The true nature and horror of the event is not what is presented on the glossy adverts promoting the festival. If that’s not shocking enough, maybe this will bring it home: the organisers recruit tourists from Australia, USA, Britain and other “civilised” countries to participate in Number 8 above, by encouraging them to get drunk and ‘take part’ in the “running” of the bulls. They then come home, and despite participating in activities that could put them in prison if they had done them in their own country, they return to their lives as if nothing happened, not knowing the reality of the so called spectacle.